Just a few short years ago, the automated home was something that was perhaps more accepted as a flight of fancy rather than a plausible reality – a neat idea that, if it ever came to fruition, would likely be either too impractical or too expensive to be a worthwhile investment for the home. And yet, these days the number of homes embracing automated technology is on the rise, a sign that homeowners are beginning to realize that the costs and inconvenience of integration of such technology are greatly outweighed by the value and benefits they provide. Now, consumers are faced with a new dilemma – a problem that doesn’t have them posit whether or not smart home technology should be purchased, but instead, one that begs the question, what technology should they purchase? Amazon Echo: Does it Do Enough? If you’ve familiar with the Amazon Echo, you may have heard tell that it’s classified as, above all else, a music player – but in reality, it’s equipped to do so much more. You can talk to it, and it will answer. It will tell you the expected weather forecast for the day, what’s on your agenda, and if you ask it to, it will help you keep track of the things you need to pick up at the grocery store. 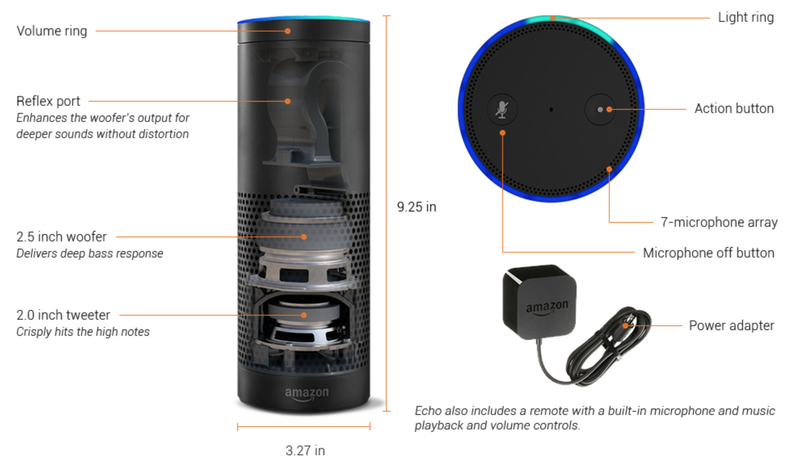 At roughly a foot in height, the Echo resembles a Pringles can painted black; and while it doesn’t contain a delicious sodium-laden snack should you happen to pop the top, we can unequivocally say that the Echo’s other many features will help you forget that profound, albeit fleeting disappointment. Believe it or not, the Amazon Echo, which retails for about $180, is an incredibly economical way to control many of your smart home devices via a singular hub. As more and more home appliances get added to the Internet of Things (a notion that has everyday objects integrated with network connectivity so that they can essentially speak to one another), homeowners will be able to add more and more devices to the hub. That means that eventually everything from your motorized solar shades to your movie collection might be accessed through the Echo. So, What Can the Amazon Echo Do Today? As cool as it is, the Echo is not the end all be all in smart home technology, but it does offer an unobtrusive and budget-friendly way for those interested in the technology to ease into it. That being said, we should probably explore some of the things the Amazon Echo is equipped to work with as we speak. Using Belkin’s WeMo Switch and the Amazon Echo’s voice recognition feature, you can issue a voice command to the Echo to turn your lights on and off in a given room. Automation of lighting is among the first smart home technologies that homeowners typically adopt, largely because it’s something that can be used every day. Imagine, no longer needing to stumble through your front door into a pitch-black hallway with an armful of groceries and a child in tow. Imagine never again having to argue over who’s going to get out of bed to turn off the downstairs light. Additionally, you can use your Echo to make your Philips Hue smart LEDs alternate colors during a party or whenever you want to alter the ambiance. Turn off appliances that are connected to an outlet. This pretty much means you can turn off/on anything in your home. Granted, you’ll need a Z-wave outlet, which is designed to work with smart products, but the fact remains that essentially any appliance that is connected to the power grid could be shut off with a simple voice command. For instance, if you’re running late for work and don’t want your de-humidifier running all day, a simple voice command as you head out the door will turn off the device. Currently, the Amazon Echo cannot be synched to control locking mechanisms on doors and windows, even using Z-wave technology – nor can you issue a voice command to raise or lower the home’s temperature. Though this may be seen as a hurdle for some, to others, it’s an opportunity to get creative. For those armed with a little program knowledge and a Raspberry Pi, adding a little bit of extra functionality out of the Amazon Echo is not out of the realm of possibility.